A woman and her three children suffered a scary crash today in Fall River, Massachusetts. The accident occurred in the middle of the afternoon at the intersection of Walnut Street and Danforth Street. At that time, the woman was traveling down the street as normal, when suddenly she lost control of her vehicle. As the car continued to spin out of control, it ended up going through a metal fence. However, it did not stop there. It then crashed into the side of the Apollo Safety building at the corner of Walnut. A bystander working inside a nearby building witnessed the collision and immediately called 911. Fall River Police responded quickly to the unusual scene. The woman was not seriously injured in the collision. The three children sustained minor injuries which are not life threatening. They were all taken to a nearby hospital to be evaluated. There is no further word at this time on their conditions. The woman gave a statement to Fall River police officers about the collision. She told them that she had just had her brakes worked on at a nearby body shop. Further, she stated that as she traveled down a hill she attempted to apply her brakes but they malfunctioned, causing her to lose control of her vehicle which led to the crash. 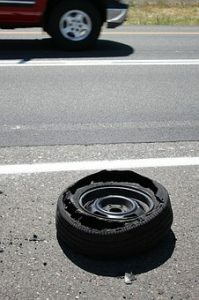 Equipment defects are one potential cause of serious car accidents. Many times when we think of crashes, we think of negligence on the part of one driver or another. However, in some cases, a vehicle can malfunction causing a crash. The reason for a malfunction can vary. Sometimes the malfunction occurs because the car came in defective from the manufacturer. Other times, a mechanic may not properly repair a car or may use a faulty car part causing the vehicle to fail once it is on the road. Depending on the source of malfunction, the responsible party varies as well. If it is a manufacturing defect, the driver may try to obtain recovery through a product liability case. If there is an issue with a mechanic, the driver has a claim against the body shop which did the repair. If you suffer an injury as a result of a vehicle defect, we are here to help. At the Law Offices of Jeffrey S. Glassman, we have experience with all types of defects, from product liability to body shop negligence. Give us a call today for your free consultation, 617-367-2900.